listening to: Nick Cave and the Bad Seeds The Good Son "The Ship Song"
This week when I went vintage shopping for the store I ran across a large collection of pretty wool and velvet skirts. The mustardy-gold one I'm wearing today is one of them. I've got skirts coming out my ears so I'm selling most of them, including the one in the photo. It's just a smidgen too big for me. I guess that's a good thing because otherwise I might be tempted to keep it. I don't drink any caffeine. No coffee, no Coke, no tea. Ever. I love brussels spouts. For lunch I would like to have brussels sprouts with a side of brussels sprouts, please. When I was a little girl I collected figurines of unicorns. I have what looks like a tiny tattoo on the little finger of my left hand. It's actually a mark left from a time when I was working in an office and was trying to fix a copy machine. My hand got stuck and when I pulled it out, I cut my finger which was covered in powered copy toner. The toner would never come out of the cut, thus the permanent mark. I cry very easily. Happy, sad, angry... always equals tears. I have dreams about tornadoes all the time. The tornadoes in my dreams are always really tall and skinny and bounce around on the ground. I am currently hopeless addicted to 90210 reruns on the Soap Network. I never even realized it was on the air for 10 years. Now I have to know... will Kelly and Dylan ever work things out?!? I was going through some of the folders on my computer this afternoon, trying to organize things a bit and clean up some of the excess images that I tend to collect. I was a bit stunned to discover just how many images of one Miss Alexa Chung I have collected. I wonder… how many photos does it take to make a stalker? I fear I’m veering perilously towards the limit. To make matters worse I’ve taken to reading her column on The Independent. I know that I’ve been tagged a few times in the past couple of weeks with the “random things about me” tag (I’m working on it!) and apparently so has Miss Chung. Oh, and of all the things in these photos that I’m coveting, the one that I want the most right now are those bare legs. I’m soooo ready to retire my tights for the winter. There are few things that I miss about living in Los Angeles: friends, the flea market, an endless array of vegetarian restaurants and, I've just realized, easy access to every international fashion magazine you could think of. It was so easy then to walk right across the street to The Grove and pick up just about any magazine at Barnes and Noble. 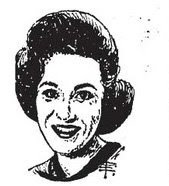 Now that I'm living in a small town on the east coast I don't think my chances are very good of running across a copy of Lula so instead I'm going to have to make do with the scans that are popping up on the internet. It's not exactly as fun as flipping through the pages myself but as girl's got to do what a girl's got to do. *listening: The Casting Out Go Crazy, Throw Fireworks "Quixote's Last Ride"
Tom and I were heading out of town to Delaware to see The Casting Out play a show on Saturday night when we passed the most adorable motel. It's made up entirely of old train cabooses painted in bright, cheery colors. How fun would it be to spend the weekend in your very own caboose? In my last post, when I asked if I had missed anything exciting, the answer is obviously yes, I was very much out of the loop in January for Fashion Week by Berns. I was missing out on the Tin Man, Robin Hood, Little Red Riding Hood, Charlie Chaplin and much, much more. As smitten as I am with the individual looks of this Minimarket collection I love the presentation even more. Be sure to take a look at the giant version of the photo above to take in all of the wonderful details. Here are a few of my favorite picks from NY Fashion Week. I must admit that I'm guilty of skimming over the collections and just looking at my usual favorites. Since I'm already thinking about spring, it's a little hard to wrap my head around these looks right now. I'm saving them all in a folder and I'll dig them back out in a few months once fall comes around again. Since I've been lazy about flipping through all of the collections are there any I'm missing out on? Anything new and exciting? After reorganizing my closet last week and pulling out all of the summer clothes I'd stored away over the cold months, I've been thinking more and more about spring. When I think about my spring wardrobe I mostly think about vintage dresses and sandals. Right now I'm trying to collect pre-war pieces - think 30's day dresses, 20's camisoles and antique leather purses. But a few new pieces have caught my eye that I'd like to throw into the mix. I have a hard time finding vintage blouses that fit so new feminine blouses are always on the list. This one by Orla Kiely kills two birds with one stone: it's a pretty blouse and it's yellow! For every day wear throwing on a simple dress and flat sandals is always the easy route. I love these two little dress: the first is from Forever 21 and the second is Built By Wendy. 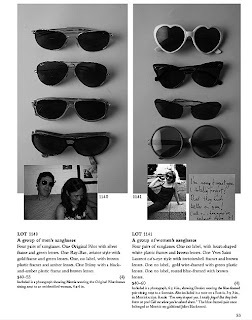 I'd like a light pair of vintage inspired sunglasses instead of the dark ones I've been wearing. I never manage to find a pair of shorts that I'm comfortable in. Hopefully this will be the year. I'm such a messy person I usually avoid wearing white. I inevitably end up covered with stains by the end of the day. But this frilly white dress is stealing my heart. 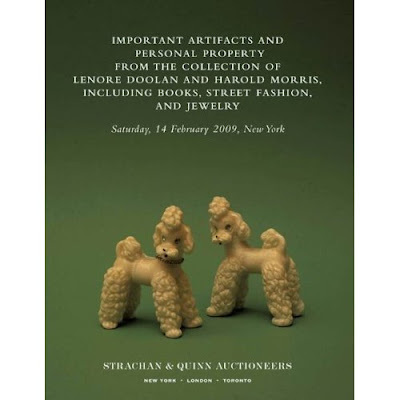 Auction catalogs can tell you a lot about a person -- their passions and vanities, peccadilloes and aesthetics; their flush years and lean.In Leanne Shapton's marvelously inventive and invented auction catalog, the 325 lots up for auction are what remain from the relationship between Lenore Doolan and Harold Morris. 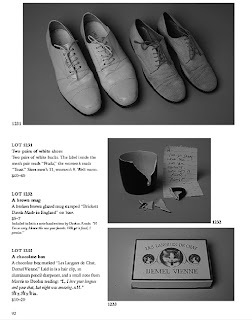 Through photographs of the couple's personal effects -- the usual auction items (jewelry, fine art, and rare furniture) and the seemingly worthless (pajamas, Post-it notes, worn paperbacks) -- the story of a failed love affair vividly (and cleverly) emerges. From first meeting to final separation, the progress and rituals of intimacy are revealed through the couple's accumulated relics and memorabilia. And a love story, in all its tenderness and struggle, emerges from the evidence that has been left behind, laid out for us to appraise and appreciate. I'm often guilty of completely ignoring the men's fashion photos on street style sites. Lately I've been trying to take more notice to see what kind of inspiration I can draw from the images. Inspiration for me doesn't have to be as literal as seeing an outfit and copying it from head to toe. The first guy here reminds me that I really want a bag like his. Really, really want one. The second photo makes me think putting together and orphan-Oliver type outfit would be a lot of fun. I know I have a little boy's denim jacket hiding somewhere in the back of my closet that I need to dig out after seeing the third guy's jacket. And the last photo reminds me how much I love the combination of black, brown and grey. I know I'm not alone in professing my love for down under label Lover. I swear sometimes I think they're reading my mind. It's so rare that I look at a line and love (no pun intended) every single piece but that seems to be the case with their Sacred Hearts collection. I have to admit that in my current state of mind I was a bit more drawn to their Southern Hemisphere looks with the plaid capes, little wool mini dresses and black and white oxfords. But since spring is nigh for us Northern Hemisphere dwellers the lighter looks caught my eye as well. The one thing that reaaallly stuck with me is the adorable straw boater hat that ties all the looks together. I've become a bit addicted (in a good way, I think) to wearing hats and I was kind of wondering what I was going to do with all of my wool berets once the weather warms. After looking at the Lover lookbook the answer seems obvious. I thought finding a similar hat would be just a Google search away but I'm afraid it might be a bit more difficult than that. See, I don't want to end up walking around looking like I just joined a barbershop quartet or (worse) just walked out of a GOP convention. Hopefully they'll be offering the Lover version somewhere online. Otherwise, the treasure hunt begins! * listening to: Travis Ode to J. Smith "Something Anything"
Funny story about this, my favorite purse. I stopped carrying it for a while because of an incident where I was convinced that it (along with everything in it) was lost forever. I had taken it with me on the bus to visit some thrift stores one cold afternoon. At the end of the day I was piled high with bags of goodies I had bought. Once back on the bus, I tried to get everything organized so that it would be easier to carry on my walk home. I didn’t realize until I had made it all the way to my front door that the purse had fallen under the seat of the bus when I was rearranging my packages. Complete panic set in as I frantically rang the doorbell (I didn’t have my keys!). Tom opened the door to find me on my hands and knees in a pile of thrift store clothes, all dumped from their bags as I desperately hoped that my purse was somewhere buried in the mess. We quickly threw everything in the door and ran down to hop in Tom’s car (him still in his pj’s, bless him) and jetted off to the bus station. Long story short, a few radio calls later the very, very kind bus driver stopped the bus and searched under the seats until she found my purse… with everything still inside. Whew! I wasn’t sure which I was more upset about: the thought of losing every thing that was in my purse or the purse itself. After that I was terrified I’d somehow manage to lose it again, this time for good. I guess the panic has subsided because I was happy to pull it back out of its hiding place this morning. I am hard at work getting everything ready to post the new auctions on Sunday. So far, I have managed to finished up with the shoes and now it's time to move on to the clothes. Here's what I have so far! This is partly a result of the massive closet clean out that happened earlier this week. You'd think that since most of these shoes came out of my closet they'd all be the same size, but alas, that is not the case. I think that just goes to show how determined I can be to wear a pair of shoes whether they be too big or too small as long as I love them. I felt a bit like Goldilocks as I went through my collection. A bit too big, a bit too small, but none of them just right. So... I'm hoping they'll all find good new homes with you! photos and editing by Tom b. *listening to: Cat Stevens Mona Bone Jakon "Trouble"
After my last "this is what I'm wearing post" I thought it was so funny that a commenter asked if Tom and I live in a ghost town. No, I assure you we live in a town with other living, breathing people. It's just that we tend to seek out these abandoned places to explore and photograph. Lately Tom has found some really amazing places to shoot but I've been too much of a wuss to accompany him because of the cold. Hopefully once the weather warms a bit I'll get back to doing some more creative photography. I am loathe to admit that I spent the greater part of the early-nineties in a pair of worn out Liberty overalls that I bought at a local thrift store for about two bucks. What can I say? I'm blaming it all on Marissa Tomei for looking impossible cute in hers while skating around the ice in Untamed Heart. Over the past year or so we've all noticed the slow rebirth of nineties fashion. First it was the floral babydoll dresses, then Doc Martens and if I'm guessing correctly overalls may be next (or maybe they already are and I'm just behind the times!). I've seen them popping up in all sorts of places over the past few weeks. But the ones I'm seeing are not my old beat-up, paint stained Liberties - they seem a bit more grown up and tailored this time around. Even though I've often sworn I'll never go back to wearing things I wore in my teenage years, I've spied a few pair that have me rethinking that. While I've readily admitted that I'm still basking in the freezing weather and enjoying the bits of snow left of the ground, thoughts of spring have begun to invade my mind. Yesterday included a huge closet clean-out where I realized I'd been hoarding sweaters and shoes and put about half of each into a pile to sell. Cleaning out the closet is always my first harbinger of spring fever. The APC collections always seem to knock me into high gear for the next season and this one is no exception. I love their vision of early spring with lightweight long sleeve dresses and bare legs, strappy sandals worn with socks and of course, the perfect trench coat. Since my pockets don't run APC-deep, I'll have to mine my own closet and keep my eyes open at vintage stores to see what I can come up with. That last outfit: loose floral dress, super soft cardigan, white sneakers (how Swedish!) and of course, a beret. It's perfection! listening to: Neko Case Fox Confessor Brings the Flood "Hold On, Hold On"
I've been wanting to wear this little coat ever since I picked it up at a local vintage store that was closing down but it's simply been too cold. It's pretty bad when it's too cold outside to wear a coat! I paired it with a long chiffon scarf I picked up at a thrift store. I think the look ended up being a little bit Madeline so it was apropos that Tom and I ran across an abandoned school when we were driving around yesterday. We snapped a few photos on the old playground and then wandered inside to have a look. Tom found the sweetest little children's song book from 1932 and gave it to me. It had me singing old tunes in my head for the rest of the day. If there's been one accessory that been indispensable for me other the last few months, it's been my berets. It's really gotten to the point that I feel a bit naked without something covering my head. I'm usually in a camel one or a black one but I've also got several other colors in my arsenal. This past week I ran across a collection of vintage 70's berets in a nice variety of colors and textures: cute stripey ones, red knit ones, camel wool ones! Looking in my closet I realized I certainly don't need to add any to my collection so I put them up in the store instead. I'm offering them in two sets of four as shown. Here's a peek at just a few of the pieces that will be going into the store this week. Thanks so much for stoppin' by! I haven't really started thinking too much about spring yet but if I was thinking about spring, I might be thinking about swim suits. I'm so picky when it comes to swimwear and I never see any new suits that I like. Even most of the retro inspired vintage-y suits don't quite live up to the vision of the suit I have in my head. 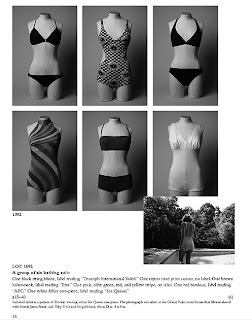 I've tried my hand at actual vintage swimwear only to find that the elastic is rotten or parts of them are stiff (ick!) or they completely stretch out of shape upon contact with water. All of my swimwear issues may be a thing of the past if I can get my hands on one of these suits from Geronimo. They are the brainchild of California based Jenny Reyes who arrived at this collection after an enviable path that included designing stage costumes for Jenny Lewis and the Watson Twins and interning at Rodarte. Each of the suits come in a variety of patterns/colors but honestly, I can't imagine them better than they appear here. My plans for getting out and about today have been foiled by the snow that is now pouring past the window under which my desk sits. Instead of getting out and taking some photos for the blog like I'd hoped, my day has consisted of going to the grocery store (in pajamas and snow boots, mind you) and preparing packages for mailing. All of this after Yahoo suddenly decided I must be an evil spammer and temporarily locked me out of my email. Yikes! That was not a fun moment. All is well now and I'm snug in my apartment, content to watch the big fat snowflakes that are piling up on my window ledge. After yesterday's little Dear-Abby themed rant (sorry about that, I was a little pissed), I figured I'd take it one step further and play my own little game of Dear Sally Jane. I often receive questions from readers and I try to answer them all but I'm admittedly not as good about that as I should be. So... today I'm going to address a recent question by doing one of my Four Ways posts. Indeed, a plaid skirt always runs the risk of looking a little school-girlish but when paired with the right tops and accessories it can be sophisticated and mature. I like to wear my plaid skirts with neutral tops in browns, blacks or navy. A military inspired blazer or vest is a good option as is a pretty lacey blouse. A belted cardigan works on cooler days. And if you don't want to come across as a school girl, you can always be the school librarian, right? Hope this helps! I have this friend. Let's call him Ebay. Me and Ebay go way back. We've been friends for years and for the past couple of years we've even been working together. It's been up and down but lately things have been going really well. The problem is he recently changed. His payment policies, that is. And didn't tell me anything about it. He just up and decided he didn't want to accept money orders anymore. Just like that. I feel betrayed! Instead, he went and cancelled all of my listing without telling me first! How cold is that? All I'm asking for is a little heads up when he's going to change. Is that too much to ask? Reeallly? Luckily I was able to get all of my auctions back up and running. So if anyone out there was watching an item or bidding on an item, I'm super sorry that the auction you were watching disappeared. But not to fret. All is well now. All of the listing have been reinstated. Thanks so much.